Manchester United target Zinedine Zidane has reportedly ‘closed’ an agreement to become the next Juventus manager in the summer. 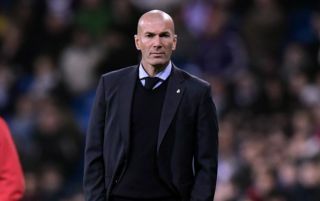 The former Real Madrid boss has been the subject of much speculation in recent times ever since leaving Madrid at the end of last season following a hugely successful spell in charge at the Bernabeu. According to Don Balon, Zidane’s next move will now be Juventus, with a deal in place for him to take over from current head coach Massimiliano Allegri. The report states Cristiano Ronaldo wants Zidane as manager after the success they enjoyed together at Real, but it looks like it’s bad news for Man Utd. Zidane has been linked several times with the Red Devils, who currently have Ole Gunnar Solskjaer in charge until the end of the season. The Sun have mentioned Zidane alongside the likes of Mauricio Pochettino as leading candidates to take the permanent manager’s job next season, but it seems he won’t be heading to the Premier League. This is surely just more good news for Solskjaer, who looks in a stronger position to take the job full time with each passing game. That said, if Allegri becomes available after leaving Juve, he could also be a good option for United, with ESPN linking them with the Italian last month.